Source of Support: None, Conflict of Interest: Ralph M. Trüeb performs consultant activity for Lexington International LLC. This study represents an integral part of Andréia Munck’s traineeship in trichology at the Center for Dermatology and Hair Diseases Prof. Trüeb. The ability of lasers to induce hair growth was incidentally noted as early as 1967 when Mester et al. used low-level laser therapy (LLLT) to treat cancer in mice with shaved backs. Since then, hypertrichosis has been recognized to be a possible side-effect of laser treatment. First described in 2002 with intense pulsed light therapy,  this phenomenon has now been widely acknowledged to occur with an incidence rate ranging from 0.6% to 10% with low fluences and all laser types. It is thought to be the result of suboptimal fluences that are too low to induce thermolysis, but high enough to stimulate follicular growth. To evaluate efficacy of the 655 nm-HairMax Laser Comb ® either as monotherapy or as concomitant therapy for treatment of male and female AGA, we performed a retrospective observational study of global photographic assessments of patients in an office-based setting. The study design was retrospective and observational. Patients who had purchased a HairMax Laser Comb ® between July 2011 and July 2013 for treatment of AGA at the Center for Dermatology and Hair Diseases Prof. Trόeb were retrieved for assessment of global photographic images performed at follow-up visits. Patients on concomitant treatment had been treating with topical minoxidil or oral finasteride for at least 9 months, before starting therapy with the HairMax Laser Comb ® . Patients used the HairMax Laser Comb ® at home according to instructions 3 times weekly between 8 and 15 min depending on the model purchased (Advanced 7, Lux 9, or Professional 12). Global photographs were performed at 3, 6, 12, and 24 months of treatment follow-up in a standardized manner with a stereotactic camera device of Canfield Scientific Inc., in which the patient's chin and forehead are fixed and on which digital camera and flash device are mounted, ensuring that view and lighting are the same at consecutive visits, thus enabling precise follow-up of the same scalp area of interest with frontal and vertex views. Global photographs were evaluated by two of the authors (AM and RMT), and scored as significant, moderate, or no improvement. In the case of diverging opinions, the inferior score was given. 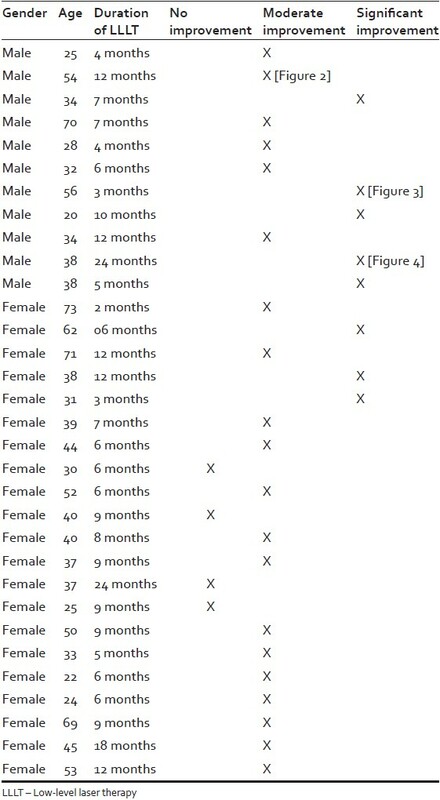 In total, 32 patients with AGA were involved in the study, of which 21 were females, aged 22-73 (mean: 43.6 ± 15.19 standard deviation [SD]), and 11 were males, aged 20-70 (mean: 39 ± 15.01 SD) total mean: 42 ± 15.1 SD. 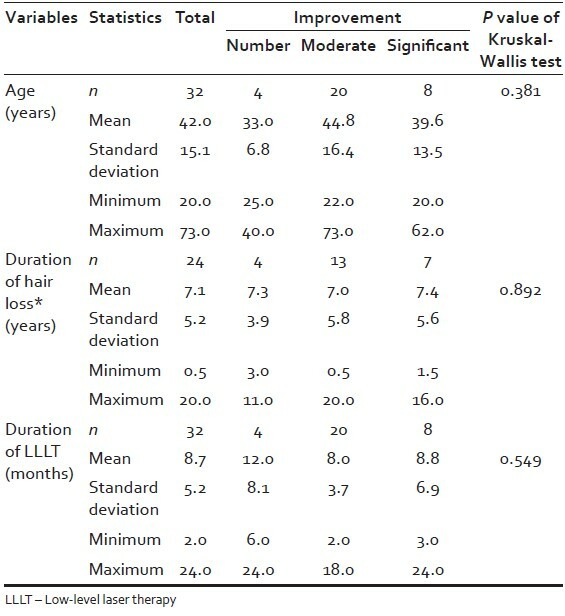 The duration of hair loss in years for men and women was mean 7.1 ± 5.2 SD. The duration of LLLT in months for men and women was mean 8.7 ± 5.2 [Table 1]. 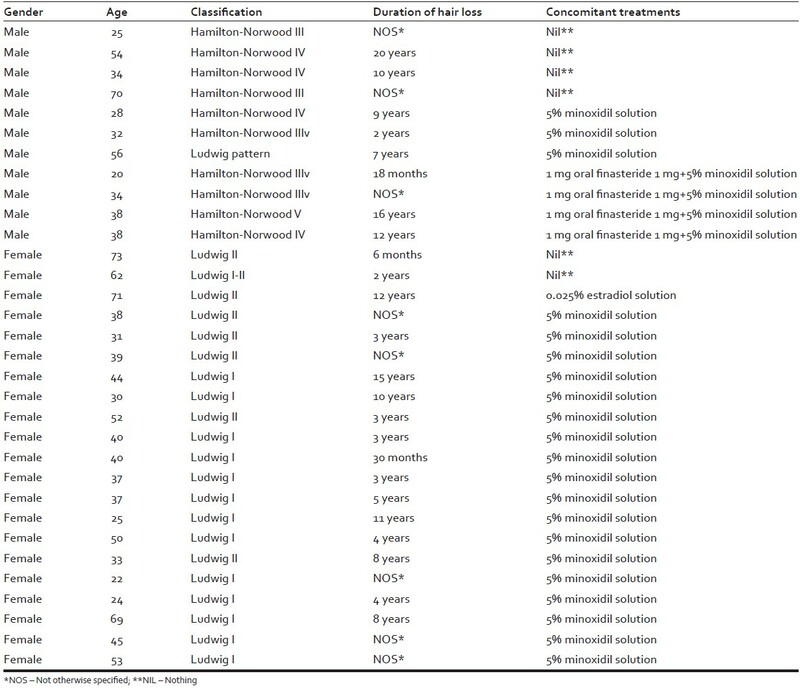 The patient characteristics, with respect to gender, age, classification of AGA according to Ludwig and Hamilton-Norwood scales, duration of hair loss, and concomitant treatments are recorded in [Table 2]. The results for the scoring of the global photographic assessment in relation to treatment duration with the HairMax Laser Comb ® are demonstrated in [Table 3]. In summary, eight patients (three female, five male) showed significant improvement, 20 patients (14 female, six male) moderate improvement, and four patients (four female, zero male) no improvement [Figure 1]. Of 32 patients, the HairMax Laser Comb ® was used as monotherapy in six patients (two female, four male), and as a concomitant therapy in 26 patients (19 female, seven male). In the monotherapy group, two patients (one female, one male) showed significant improvement [Figure 2], four patients (one female, three male) moderate improvement, and zero patients no improvement [Table 3]. In the concomitant therapy group, six patients (two female, four male) showed significant improvement [Figure 3] and [Figure 4], 16 patients (13 female, three male) moderate improvement, and four patients (four female, zero male) no improvement. There was no statistical significant difference between LLLT monotherapy and concomitant therapy with either minoxidil and/or finasteride (P = 0.829), and regarding male or female AGA (P = 0.091) [Table 4]. Treatment was well tolerated and no serious adverse events were reported. We have chosen the 655 nm-HairMax Laser Comb ® for several reasons: First, it represents the device with the most clinical study reports regarding its efficacy, ,, secondly, the cost of the device is affordable, and thirdly, the device is simple enough for patients to use at home. Finally, the fact that the device is safe, for which it received 510 (k) clearance from the FDA for the treatment of AGA, was also an important consideration. Our study demonstrates clinical efficacy of the device for treatment of male and female AGA, both as monotherapy and as concomitant therapy, in terms of clinically relevant improvement of appearance of hair. Of 32 patients, eight patients (25%) showed significant improvement, and 20 patients (62.5%) showed moderate improvement in global photographic assessments. The effect was observed as early as 3 months of treatment, and was sustained up to a maximum observation time of 24 months. The technology appears to work better for some than for others, and predictive factors which will most benefit from LLLT are to be determined. It seems though, that patients with intermediate alopecia (Hamilton-Norwood III and IV, and Ludwig I and II, respiratory) respond best, since effective photobiostimulation depends on a minimum of hair for effective photobiostimulation, and on a maximum of hair for the laser beam to reach the scalp without absorption or interference from existing hairs. The hypothesized mechanisms of action of LLLT are increased adenosine tri-phosphate (ATP) production, modulation of reactive oxygen species (ROS), and induction of transcription factors. The proposed cellular chromosphere responsible for the effect of visible light is cytochrome c oxidase (COX) with absorption peaks in the near infrared, and mitochondria the likely site for the initial effects. It is believed that LLLT displaces nitric oxid from COX allowing an influx of oxygen to bond to COX and progress forward in the respiratory process to ATP production and ROS signaling. These effects in turn lead to increased cellular proliferation, modulation in levels of cytokines, growth factors and inflammatory mediators, and increased tissue oxygenation. While the effects of these biochemical and cellular changes have broadly been studied in both animal models and clinical studies with patients, and have shown benefits in diverse conditions, such as increased healing in chronic wounds, improvements in sports injuries and carpal tunnel syndrome, pain reduction in arthritis and neuropathies, and amelioration of damage after heart attacks, stroke, nerve injury and retinal toxicity, , the effects on hair growth stimulation have only recently gained the attention of the scientific community. 1. Mester E, Szende B, Gärtner P. The effect of laser beams on the growth of hair in mice. Radiobiol Radiother (Berl) 1968;9:621-6. 2. Moreno-Arias G, Castelo-Branco C, Ferrando J. Paradoxical effect after IPL photoepilation. Dermatol Surg 2002;28:1013-6. 3. Bernstein EF. Hair growth induced by diode laser treatment. Dermatol Surg 2005;31:584-6. 4. Leavitt M, Charles G, Heyman E, Michaels D. HairMax LaserComb laser phototherapy device in the treatment of male androgenetic alopecia: A randomized, double-blind, sham device-controlled, multicentre trial. Clin Drug Investig 2009;29:283-92. 5. Avram MR, Rogers NE. The use of low-level light for hair growth: Part I. J Cosmet Laser Ther 2009;11:110-7. 6. Avram MR, Leonard RT Jr, Epstein ES, Williams JL, Bauman AJ. The current role of laser/light sources in the treatment of male and female pattern hair loss. J Cosmet Laser Ther 2007;9:27-8. 7. Kim H, Choi JW, Kim JY, Shin JW, Lee SJ, Huh CH. 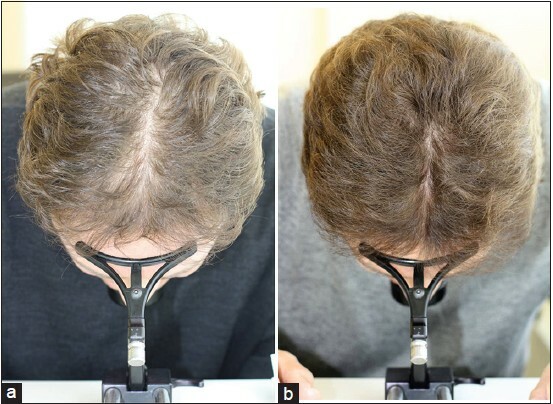 Low-level light therapy for androgenetic alopecia: A 24-week, randomized, double-blind, sham device-controlled multicenter trial. Dermatol Surg 2013;39:1177-83. 8. Blumeyer A, Tosti A, Messenger A, Reygagne P, Del Marmol V, Spuls PI, et al. European Dermatology Forum (EDF) Evidence-based (S3) guideline for the treatment of androgenetic alopecia in women and in men. J Dtsch Dermatol Ges 2011;9 Suppl 6:S1-57. 9. Chung H, Dai T, Sharma SK, Huang YY, Carroll JD, Hamblin MR. The nuts and bolts of low-level laser (light) therapy. Ann Biomed Eng 2012;40:516-33. 10. Gupta AK, Daigle D. The use of low-level light therapy in the treatment of androgenetic alopecia and female pattern hair loss. J Dermatolog Treat 2014;25:162-3. 11. Ghanaat M. Types of hair loss and treatment options, including the novel low-level light therapy and its proposed mechanism. South Med J 2010;103:917-21. 12. Satino JL, Markou M. Hair regrowth and increased hair tensile strength using Hair Max Laser Comb for low-level laser therapjy. Int J Cosmet Surg Aesthet Dermatol 2003;5:113-7. 13. Rajput RJ. Controversy: Is there a role for adjuvants in the management of male pattern hair loss? J Cutan Aesthet Surg 2010;3:82-6.